Everyone knows it's hard to get a good bagel outside of NYC. Surprisingly, it's also hard to get a good bagel inside of NYC. That is, once you've had Absolute Bagels. 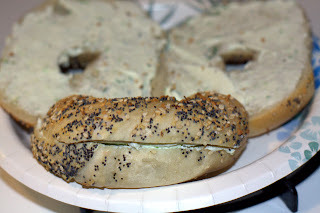 We go for the everything bagel with scallion cream cheese. The bagels are crispy on the outside and deliciously doughy on the inside - no need to toast! 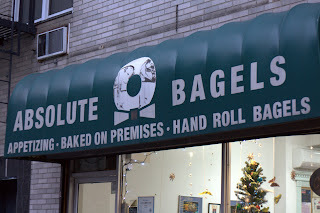 What sets Absolute's everything bagel apart from other establishments' attempts is that it has salt on the crust, as well as the usual poppy and sesame seeds, dried onion, etc. This seemingly simple recipe addition adds a world of flavor, but for some reason we haven't been able to find another bagel shop that does it! If you're looking for the best bagel in New York, look no further than Absolute Bagels.